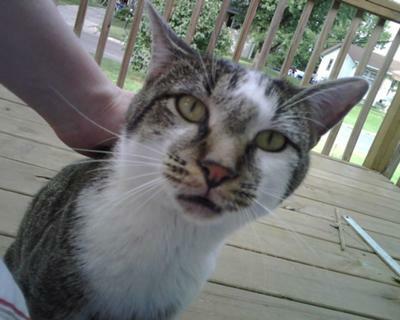 I have a house cat, and cannot keep this appx 2 year old male (neutered) stray. Over this summer, Tommy became more friendly, eventually coming to me, and finally sitting in my lap and purring. Over the last two weeks he has lost his skittishness and taken to sleeping on my lap, rubbing up against me, winding between my feet, and purring fairly loudly. I let him in the house an hour at a time, and he adapted well. The last three nights, in preparation for neutering (no food overnight), I kept him in overnight, and he would sleep curled beside me on my bed, his head on my pillow. I took him to the vet this morning for vaccinations and neuter... and he tested FLV positive. Tommy is a constant companion when he can be with me. My house cat objected to having another cat, but had begun to accept Tommy's presence on the deck and for his short stays in the house. Tommy himself adjusts well to the presence of other animals-including dogs and cats, only reacting in self defense as necessary, never in aggression. I'm not sure that Tommy is litter trained. My suspicion is that he waits and goes to the bathroom outside once he's done visiting. Otherwise he now acts like any other very loving house cat. My house isn't set up in a way that I can keep both cats separated. I'm going to test my cat this afternoon to ensure he hasn't been infected. At that point, I can keep one of them in the basement for a short time, but my basement won't provide either cat the sunlight, space, love and attention they need. Vet has declared Tommy immune, not a carrier!! The vet lab ran the second round of IFA and ELISA this weekend. The vet called earlier tonight and told me that there are still antibodies present, but that the other test is still negative. He's going to do more research because he said this is the first cat he's ever seen who tested this way, but the virologists have cleared Tommy-he's had and overcome the FLV; he's not a carrier. The vet talked to the developer of the IFA test when the lab result came back. (He was happy!) The vet informed me that only 28% of ELISA positives come back IFA negative. That means Tommy was either recently exposed or he has developed an immunity and is not a carrier, but still has some traces of the element (?) ELISA traces in his blood. The vet recommends I keep the two cats separate for two more months and then have Tommy retested. Tommy was bitten in late August in a cat fight (he got an abscess), so if he contracted FLV recently, it would have been in that fight, more than likely. If that guess is right I should actually be able to do a ELISA retest in late November. Not sure the vet will agree to retest that soon though. Still, since my house cat is FIV+, I'd still be open to suggestions or the possibility of adoption. If Tommy could be adopted and given the kind of home and attention he needs instead of being "basement cat" for the next two months, that would still be best for him. Thank you all for your help and support. Thanks all for your comments and suggestions. My house cat has tested negative for FLV... and positive for FIV. Because of this, one of them will need a new home, definitely. Neither should be exposed to the other's illness. I requested the IFA(?) as well as ELISA results for Tommy's bloodwork and should have the IFA by next Monday (10/18/10). I'll post the results and the vet's recommendations. Tommy is either extremely intelligent or had a home as a kitten. He is litter trained, though for some reason he prefers to use the cat carrier. I decided it wasn't worth the argument and put the litter box in it. There hasn't been a problem since. Tommy's a very short haired, trim cat who might suffer in the Kansas winters. I'll discuss these concerns with my vet. It would be good if either cat could enjoy some fresh air now and then. Thank you for the suggestion. Hi Mary, What a nice story and Tommy seems to be a special cat, indeed. Query - should you own housecat test postive, will you end up keeping them both? Otherwise, if you cannot rehome Tommy, is there a 100% no-kill animal shelter in your area? Otherwise, what about getting an outside "cat house" for Tommy for the porch? I just got one from Wal*Mart for about $42 (Petmate Petbarn II). It comes in 2 pieces that just snap together. Wal*Mart doesn't sell the door to it, but I found the website where you can order one. The door is like a couple plastic strips - like the type you see in commercial freezers or at your local Au Bon Pain over the refrigerated shelving. My intent was to put mine on the back porch for our strays/ferals; however, my newest furkid has decided that she likes it, so that means I'll get another for the kids outside. Hi Mary, thanks for using PoC to try and re-home Tommy. I hope you succeed. Well done in caring for him too. Good luck to you both.